With it being so close to Halloween I wanted to share a childhood sweet treat. 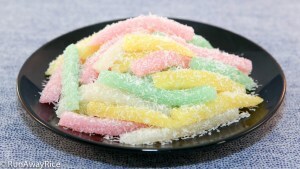 Growing up, every kid I knew loved Silkworm Cassava Cake. Perhaps it’s the bright colors, the chewy, slightly stretchy consistency which prompted us to play with the cakes before eating them or even the mild sugar rush. Whatever the reason, my Mom always kept a steady supply of these cakes around for us to enjoy. Below is the super easy recipe. In terms of Vietnamese cakes, it doesn’t get any simpler than this: 1) Mix the batter 2) Steam the cakes 3) Cut and roll in shredded coconut. If you’re interested in making a fun treat for Halloween, watch the video for my recipe twist. Enjoy! Use any plate, dish or mold you have handy for this recipe. I like using my salad/dessert plates. They’re about 9-inches in diameter and make the perfect cakes. You don’t want to use a plate that is too large otherwise your silkworms will be thin. Steaming time varies depending on the size of your cakes. The cakes typically steam for 5-6 minutes. You’ll know the cakes are done when they turn translucent. Try not to over-steam or the cakes will be tough. When removing the steamer lid, lift one side of the lid up and allow the water to drip down the other side. This prevents the water collected on the lid from dripping onto the cake. Allow the cake to cool completely before removing from the plate. When the cake is warm, it’s sticky and difficult to separate from the plate. The cake taste best if eaten within the day. Leftovers can be stored in the refrigerator for up to a week. To reheat, simply microwave on Low Power for 30 seconds. For a fun twist, use cookie cutters to cut the cakes into fun shapes and sizes. The kiddies will love these cute cakes in their lunchbox. In a large bowl, combine the grated cassava, sugar, vanilla sugar, salt, tapioca starch, and coconut milk. Stir until well-blended and batter is smooth. Scoop out 3/4 cup each into 3 smaller bowls and leave the remaining in the original bowl. Add different food coloring to each of smaller bowls and mix well. Pour each of the 4 batters into separate salad/dessert plates. Spread evenly and smooth out the top. Prepare the steamer by filling it 2/3 full with water and bringing to a boil. Reduce the heat to Medium High. Please the first plate into the steamer and steam for 5-6 minutes or until the cake turns translucent. Remove the cake and continue with the next one. Continue until all 4 cakes are steamed. Allow the cakes to cool for at least 15 minutes. Place the shredded coconut into a large bowl. Using a small knife, run it under the cake along the edge. Carefully lift and peel the cake from the plate. Cut the cake in half and then into thin strips, approximately less than 1/2-inch thick. Take a few pieces and drop them into the bowl with the shredded coconut. Roll the strips in the coconut, coating them completely. Repeat this process until all cakes are cut and coated. To make the sesame seed topping, combine the sesame seeds with sugar and salt. Just before serving sprinkle the cakes with the sesame seed topping. I bake cassava cake today by follow your rescipe. It turns out so good. Thank you for sharing us with tips that made cooking more simple. Just a tip, I use fresh cassava but t grate it with a juicer machine. It separates the liquid and the grated cassava but then I put them back together and continue with the ingredients. The texture is perfect and this recipe with coconut milk always turns out great. Can this be made with cassava flour instead of grated cassava? I’ve made this dish before but was not happy with the result, and I really like your recipe. I know it’s all personal preference, but I do like your ratios, a lot. The “cake” had the right consistency: soft and chewy. I made the recipe before with 2 Tbsp tapioca for one 16-oz bag that it came out a bit too dense. I also like the 1 cup of coconut milk per 16-oz bag ratio (vs. the 1/2 cup I used to make). I made it for a party and everyone was saying that it was so good, and so much better than buying in the market (qualities vary there too). Also, I used the frozen grated coconut in the Asian grocery store for the coating instead of the desiccated coconut and it was vastly superior. Steaming the coconut a few minutes also helped bring out the flavor. Yes, you can used fresh cassava that you shred yourself. With fresh cassava, I recommend that you soak the shredded cassava in water for an hour or so to help remove the toxin. Several changes of water is good too. Once you cook the cassava, the texture is the same. Hope that helps and good luck! Mmmmmmmm…I’m so gonna make some tonight. May I ask where can I get the frozen coconut? Thanks so much for the detailed instructions. You can buy frozen coconut in the Asian grocery store–same place you find the grated cassava. However, the shredded coconut that I am using is dried and you can buy this at any American grocery store. Good Luck with the recipe!